Someone said to me, How many of these did you buy?!!! One too many, I answered! 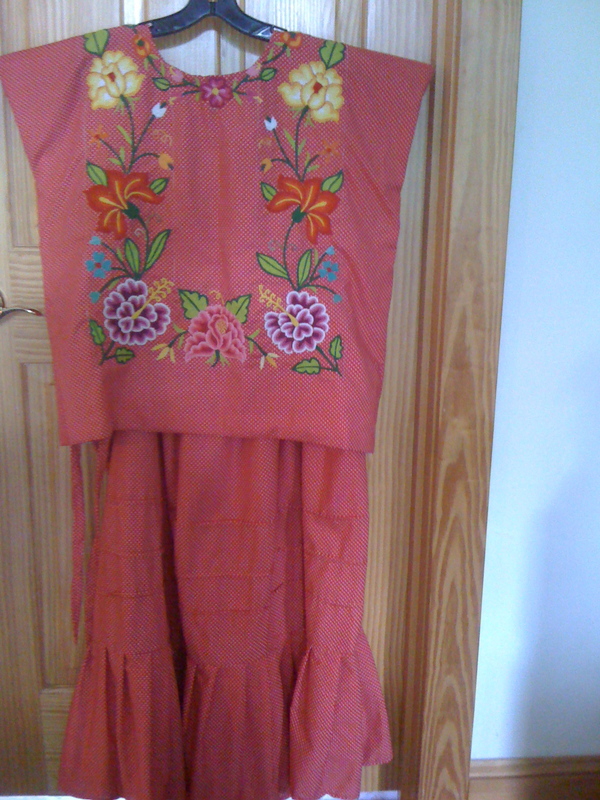 Lovely, brand-new, never worn tomato-red polka dot cotton skirt and blouse (falda and huipil) hand sewn and embroidered from Juchitan, on the Isthmus of Tehuantepec, Oaxaca, Mexico. 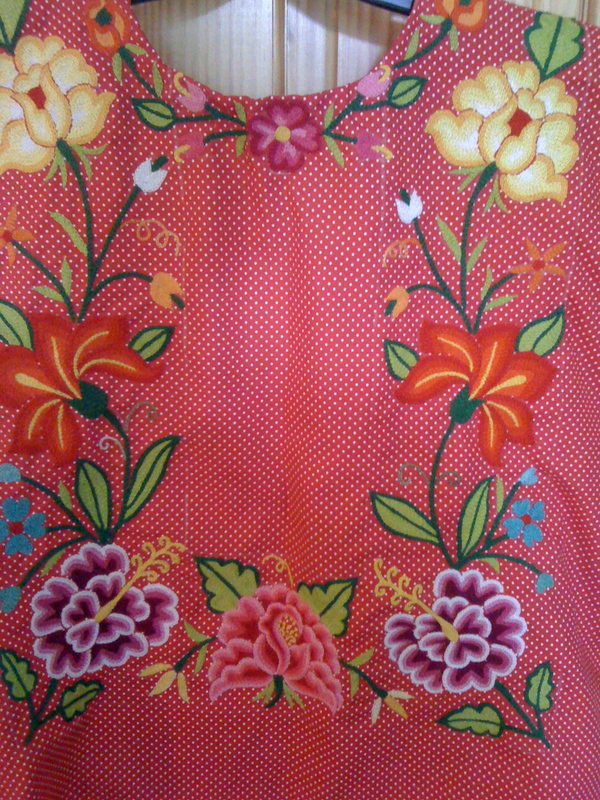 The famous women of Tehuantepec (Tehuanas) are known throughout Oaxaca for their extraordinary needlework and brightly colored floral blouses. The blouse is lined, intricately hand-embroidered with an abundance of flowers in traditional Tehuana design. The skirt is gathered at the waist, has a tie waist band with slit to easily slip over your head, making it adjustable for one size fits all. There is a subtle ruffle detail along the hemline. The waist band can wrap around double to fit a smaller size or open up so that it easily fits a size 16-18. The blouse, likewise, can fit a size 10-18, by opening up the side seams and making it smaller. Right now, it will easily fit a size 14-16. I bought four of these beautiful outfits and decided that I have one too many! I travel to Oaxaca regularly but rarely get to Juchitan because it is a 6-hour trip by car through a two-lane winding mountain road. So, these extraordinary outfits are not easy to come by! The others I have are so comfortable and graceful that I am wearing them to my office. Thank you. This entry was posted in Oaxaca Mexico art and culture and tagged huipil and falda Juchitan, Oaxaca embroidered bouse, Tehuanas embroidered blouse, Tehuantepec dress. Bookmark the permalink. do you have any more oax outfits?